A trigger finger is a condition of the flexor tendons of the finger and the A1 pulley. It results in pain and a clicking or triggering sensation of the finger after the finger is flexed. The finger cannot be extended and is locked in flexion. The flexor tendons move the the finger joints when the muscle is contracted in the forearm. The A1 pulley is a fibrous band on the base of the finger at the junction of the finger and the palm of the hand that helps to hold the flexor tendons in place as they course from the hand to the finger. Surgical repair of trigger finger involves releasing the A1 pulley by cutting the fibers with a needle through the skin or by making an incision with a scalpel. Post-operative pain is a normal side effect of any surgical procedure and usually subsides in a few days after surgery. Some patients benefit by elevating the hand after surgery to reduce the pain and swelling, according to the American Academy of Orthopaedic Surgeons. Residual clicking or triggering can occur if there is an incomplete release of the A1 pulley, previous scar tissue, or if post-operative scarring or adhesions form causes residual clicking. Surgeons check function of the finger intraoperatively to ensure an adequate release of the A1 pulley and a resolution of the symptoms. According to Wheeless' Textbook of Orthopaedics, adhesions or scarring forms if patients do not begin early range of motion exercises of the finger. This would decrease the risk of adhesions able to cause residual clicking or triggering. Infection is a risk of any surgery. The risk of infection from trigger finger surgery is low, but remains a risk, according to the Cleveland Clinic website. It is advised to keep the surgical site clean and to not remove the operative dressing until the followup appointment. 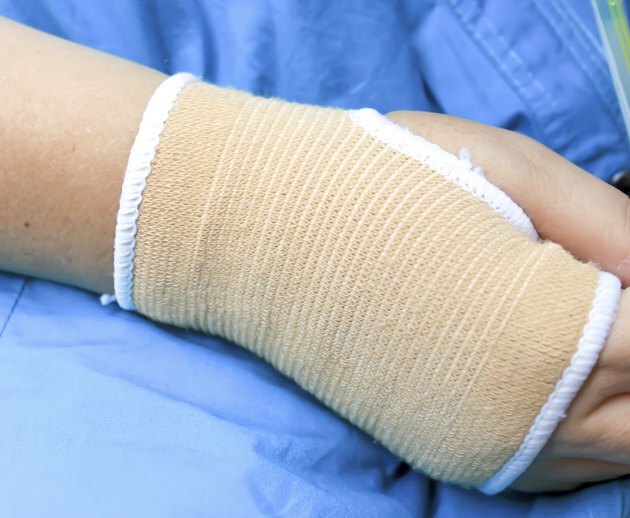 The hand surgeon performing the procedure will discuss specifics in regards to wound care. The neurovascular structures of the finger pass on the inside and outside of the finger. These structures are typically not too close to the site of the incision. Injury to neurovascular structures is always a risk of surgery, although this occurs infrequently from a trigger finger surgery. Rheumatoid arthritis patients are treated differently than non-rheumatoid arthritis patients for trigger finger, according to "Current Diagnosis and Treatment in Orthopaedics". Rheumatoid arthritis patients require a removal of the synovial sheath of the tendon and an excision of a slip of the flexor digitorum superficialis. If rheumatoid patients undergo a A1 pulley release, there is a risk of increasing the ulnar drift of the fingers and finger deformities associated with rheumatoid arthritis. "AAOS Comprehensive Orthopaedic Review"; Dr. Jay Lieberman (ed.);2008. "Current Diagnosis and Treatment in Orthopaedics"; Dr. Harry Skinner (ed. ); 2006.